Work trucks are designed to be tough, so the last thing you need are flimsy plastic running boards. The Aries RidgeStep™ running boards are rugged and tough which compliments any work truck perfectly, and they look great too. These boards are made to handle the roughest and worst work conditions you can put them through. RidgeStep™ running boards are commercial grade steel with a stamped, non-skid tread area that is 6.5" wide. There is no plastic parts to crack or break on these running boards. A black textured powder coat finish will help your new side steps withstand scratches, grime, and rust. Aries RidgeStep™ running boards use custom mounting brackets that come with the boards to give you a quick and easy installation. You won't have to drill or cut anything on your truck. They simply bolt to your truck using pre-existing holes, no special tools required. Don't put any of those other flimsy steps on your work truck, go with the commercial grade Aries RidgeStep™ running boards! RidgeStep™ commercial running boards from Aries come backed by a five year warranty against defects in materials or workmanship. Please give us a call if you have any questions or if you need to file a warranty claim. 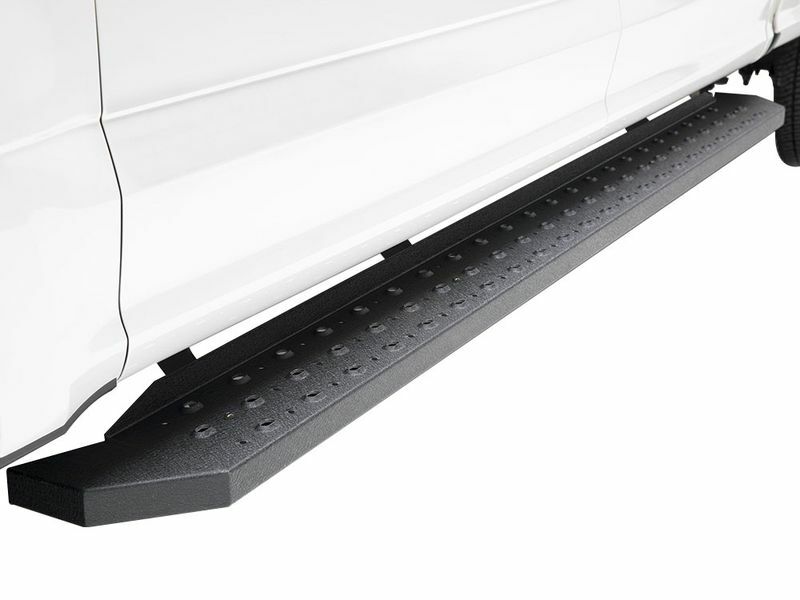 Commercial-grade RidgeStep™ running boards use custom designed mounting brackets for an uncomplicated, no-drill installation. Installation won't require any special tools and should only take about a hour or so out of your weekend so you are ready for the job site come Monday morning. If you want more information or have a question you would like answered, please give us a call and we'll be happy to help you out!